Did this holiday season run anyone else over by a truck? Thanksgiving got blown in by a blizzard, quickly followed by my birthday festivities, a week long flu, and then BAM CHRISTMAS. I did take some time to get all artsy-craftsy in the weeks leading up to the 25th, though. I was invited by the folks at The Paint Bar to try out a class at one of their studios. Though I had reviewed a similar company a few years ago, I was still excited to try this out. If you’re unfamiliar, this is a social painting lesson where you show up with any level of experience (yes, even zero experience) and leave with a fabulous piece of art. I always have a good time at these types of things and I wanted to see what a permanent location had to offer. 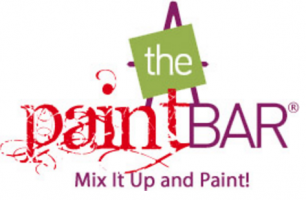 Rather than other outfits who bring the creative fun to bars in the area, The Paint Bar has two locations – Newton and Newbury St. This means the set up makes a bit more sense when it comes to actually being able to see and hear the instructor and getting your supplies. Big points for The Paint Bar. The first thing I noticed when signing up for a class is that these types of sip-and-paint places have come a long way in a short time with the types of paintings offered. There’s a lot more advanced-looking stuff that I’d actually want to hang. My first choice was a chalkboard advent calendar, but the universe conspired against me the day of the class and I had to reschedule. I ended up choosing a snowy Boston cityscape. Our instructor, Elly, led us through simple steps. That’s what I love most about these classes – you see the finished work hanging up and think it looks super complicated and that yours will never look like that. An hour later you’re patting yourself on the back and contemplating which gallery will exhibit your work best. I think the key is to not think TOO hard about what you’re doing and to stop while you’re ahead. Also, take a sip of wine before each brush stroke. Thanks to my friend and coworker Emily for being my date and thanks to The Paint Bar for providing us with a free class!